A magical world of castles, princesses and ponies to life. Classic playset unfolds into a multi-room palace with look-out balcony, turrets, and staircase. In the pony stable, feed and groom her royal pony with its soft forelock and tail as it makes fun sounds. Eat in the dining room complete with table and chairs or sit by the fireplace with realistic sounds activated by the touch of her wand. 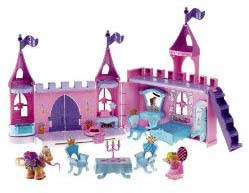 Playset includes Princess Sarah Lynn, magic wand, royal pony, and dining room table and chair.